To be informed of when the registration and travel support application opens please subscribe to the Fields maillist. Each workshop will be preceded by one week of introductory lectures; during the remaining time we will run seminars, colloquia and other activities. We anticipate that Workshop 2 and 3 will be held back-to-back as joint activities with the Perimeter Institute. Workshop 4 is organized jointly with PIMS CRG Program Geometry and Physics. From July 2 to August 30, study sessions, study seminars, informal lectures, research seminars, and working seminars will be organized spontaneously, by students, Fields postdoctoral fellows and members for the program. Anyone who is interested in attending the summer school should register online. Limited funding for local accommodation is available. For travel expenses, participants are urged to seek funding from their home institutions/countries. Each workshop will be preceeded by a 1-2 week graduate course comprising 10-15 lectures by the principal organizers and workshop attendees. 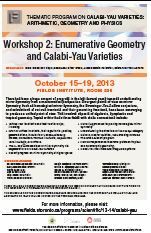 The course will include materials on Calabi-Yau varieties covering all aspects of the subject: arithmetic, geometry and physics. While the courses can be attended just by themselves, they are meant at the same time as a preparation for the upcoming workshop. It is recommended that students should attend the introductory workshop (August 26-30) to find out about this lecture/seminar graduate course. Graduate students who are registered for credit are required to attend various seminars (PDF seminars, study seminars and members' seminars) as well as the concentrated graduate courses and workshops. Each student will be assigned some research project at the beginning of the semester. Then each student is asked to give a presentation on an assigned research project at a seminar and then write up the presentation. The course grades are based on attendance (40%), and presentations (oral and written) (30%+30%). Principal Organizers: Mark Gross, Radu Laza, Jaume Gomis, Shing-Tung Yau. Topics : Algebraic geometry, Symplectic geometry, Tropical geometry. Note: Workshops 2 & 3 will be organized jointly with the Perimeter Institute. In order to ease participation in both workshops, they will be held back-to-back, one at the Fields Institute and the other at the Perimeter Institute. Principal Organizers: Vincent Bouchard, Jaume Gomis, Sergei Gukov, Johannes Walcher, Shing-Tung Yau. Principal Organizers: Charles F. Doran, David Morrison, Radu Laza, Johannes Walcher. In-between workshops we will run several regular seminars and colloquia. There will be a weekly research seminar aimed at members and postdoctoral fellows. It will be accompanied by study seminars (mainly for postdocs and students) and mini-symposia as the need arises. Colloquia will be organized on a roughly biweekly schedule with the possible exception of workshops. Additional support is available to support junior US visitors to this program.